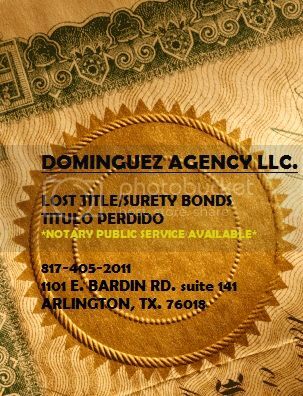 Lost title surety bond services & notary public. The process is very easy to complete, I have done tons over the years. Give me a call if you need a quote or have questions, if you get a free auto/home/other quote along with the bond you'll get a discount on the bond service! We also have several different bond services available if needed. We also can issue Bid & Performance bonds for those contractors out there.